Voted the Sexiest Beach Bar in Jamaica The 3rd Sexiest Beach Bar in the Caribbean and the 12th Sexiest Beach Bar in the World.... Travel Channel. 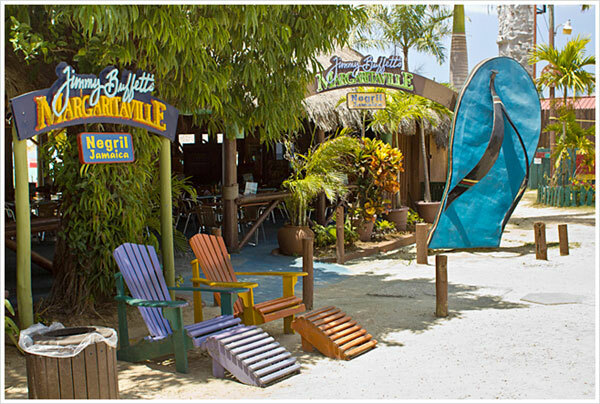 Hot on the heels of Margaritaville Montego Bay, Margaritaville Negril opened in December 1996 along Negril's world famous 7-mile stretch of white sand beach. Encouraged by the runaway success of the Montego Bay restaurant they opened less than a year earlier, Brian and Ian opened the Negril branch of the beach bar and grill to the delight of tourists and locals alike. Fun in the Sun Featuring giant TVs, private beachside Cabanas, a new sunset bar, swinging "sky chairs" and all day music, Margaritaville Negril is the perfect place to hang out and chill. Right on the sand beach, it's the spot to bounce about on our giant water trampoline, laze on the beach and at day's end, to enjoy a spectacular sunset. A unique Negril attraction is Margaritaville's giant water trampoline. Anchored in the water 10 yards from the shore, spanning 30 square feet, the trampoline has become a popular attraction with both adults and children. In 2003, Margaritaville Negril opened Jamaica's newest rock-climbing wall to great enthusiasm and excitement. Parrot heads with a sense of adventure and a taste for heights can enjoy reaching new peaks. And an enclosed children's area complete with mini slide and swings keeps the parakeets busy and allows them to enjoy the Margaritaville lifestyle. Our Trading Post sells exclusive Jimmy Buffett merchandise, souvenirs, a colourful range of beach and swimwear. It's all About the Break, Man! For the past 7 years, thousands of excited Spring Breakers have been flocking to Margaritaville to enjoy its legendary week-long programme of fun and frolic in the sun. Mardi Gras night, green beer, a beachside foam pit, visiting international deejays and daily 2-for-1 drink specials are all part of the ultimate Spring Break experience at Jamaica's undisputed Spring Break headquarters.